Elliot Lelievre looks at why winning the bid for the next edition of the world’s biggest sporting event was in both Russia and FIFA’s interest. For a number of years, Russia’s political leadership has been trying to boost its “soft power”. After successful bids to host the 2014 Winter Olympics, the 2018 FIFA World Cup and a number of other high profile sports events (the World Championships in Athletics, a leg of the Formula 1 Grand Prix), the country is returning to the world stage and intends to show that it is a modern country and that it can make a difference in the world of sports, not only through the successes of its athletes but in other ways too. Conscious of the unifying power of sports and the fascination they generate, the Kremlin has adopted a sports strategy based on the promotion of sports to the young. From September onwards, the campaign will receive an annual budget of 33 million euros ($44.93 million). The Russian government has thereby made a strong commitment to returning Russia to the status of a major force in world sports. To this end, Russia has allied itself with the other BRICS countries (Brazil, India, China and South Africa), aiming to reinforce the role of developing countries in world sports, with a certain degree of success. With the exception of India, all of these countries have hosted sports events of global significance in the recent past, or are to host such events in the near future. FIFA's choice to award the 2018 World Cup to Russia was the result of several complementary factors. First of all, Russia is a country in which sports culture plays an important role, although there are enormous disparities between the different disciplines. Russian soccer has only recently begun catching up with its European counterparts in terms of attractiveness and performance, while the athletes of the former USSR were considered among the best in the world. In addition, the country had never won a bid to host the world’s most watched global sports event. FIFA’s interest was thus to seduce a new segment of the world population and to extend its empire to cover the whole world, following the advice of Pierre de Coubertin, the founder of the Olympics, who once said: “the games must embrace the life of the world” – and in this case, so must soccer. Also worth mentioning is the fact that the high cost of the Sochi Olympics did not provoke a similar protest movement in Russia after the awarding of the event. FIFA could thus reasonably estimate that there would be little popular opposition, if at all, to damage the image of the organization, already heavily tainted by recent corruption scandals. 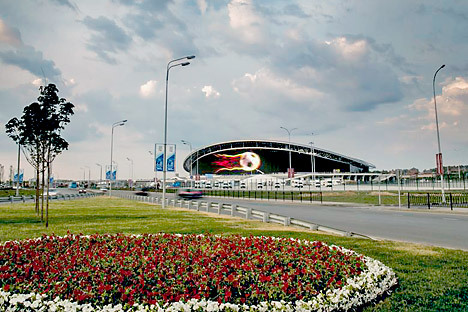 Moreover, unlike Brazil, to a certain extent Russia is already furnished with the required transportation infrastructure (the main cities in the country are already connected by rail and air, with high speed trains running between Moscow, St. Petersburg and Nizhny Novgorod). Finally, FIFA’s choice can be explained by the geopolitical situation of the country. Russia is a country that has the means to finance the infrastructural needs (soccer pitches, accommodation etc.) and additionally it is not prone to internal political instability. As Pascal Boniface, director of the Institute for International and Strategic Relations (IRIS) explained, for FIFA the choice of Russia provides the reassurance of a strong state in which there is no room for political squabbling.